We had a surprisingly good dinner at Boston's Fish House recently. I say surprisingly because, our first time there, I thought there was a bit too much breading and fried food. But this time, we ordered some great items that were not fried and it was all very, very good. Maybe a bit pricey, but still good food. We journeyed the whole mile away from home to there on a weekend night with a friend and decided to start off with an appetizer, the Fried Mushrooms. Now, forget about what I said previously about too much breading and too much fried food--these were really very good. They came out of the kitchen nice and hot, and a very good-sized portion. 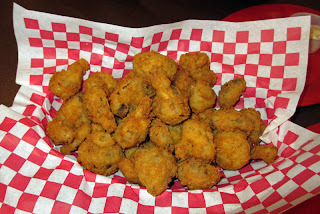 The breading was light and not at all greasy, and lent a nice flavor to the juicy, meaty mushrooms. I liked this a lot. For dinner, both Tommy and I ordered the Mahi-Mahi dinner. 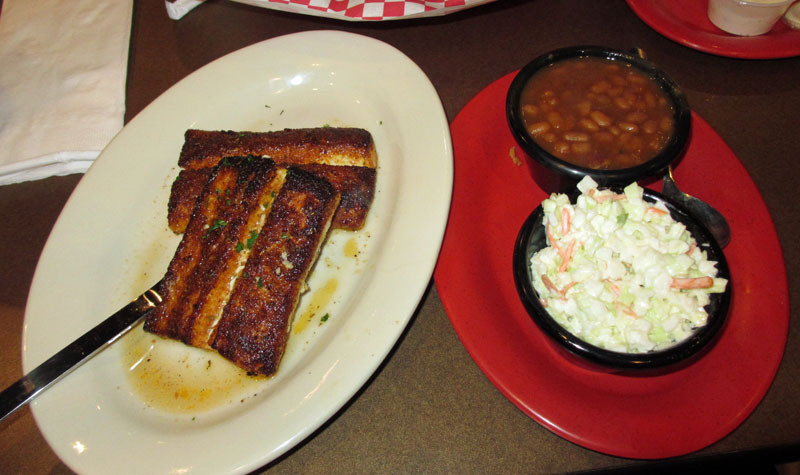 I had mine done blackened, and Tommy chose the Cajun. He thought the cajun was just a bit too spicy for him, but i thought both were very good. We had them both baked, too, not fried. So this really was good. We each took home about half our fish and enjoyed it another day (as a fish sandwich). Last time I had the beans, I called them "unremarkable," but this time they were a lot better and I really enjoyed them. The coleslaw was good, too. Again we had a nice meal here and will have to return. Yumm! We had a coupon and so decided to venture to our nearby Olive Garden one evening recently. It was a good choice and we had a very good meal and a nice dining experience. We were quickly seated and Bryce, our server took great care of us. We came because of the $5 off coupon for their "3 Course Italian Dinner for $12.95" and we left full and with some leftovers. It was a good choice. There are a lot of great choices on the menu and so we started out with the Grilled Chicken Flatbread for an appetizer. A god portion of tender chicken, mozzarella, roasted red peppers and basil with an alfredo and garlic spread was nicely grilled, warm and yummy. This was good comfort food. The roasted red peppers added a very nice gently heat to the tender and moist chicken. We liked this dish a lot. The special is basically a choice of soup or salad, an entree, and a dessert. We both chose to begin with a salad. 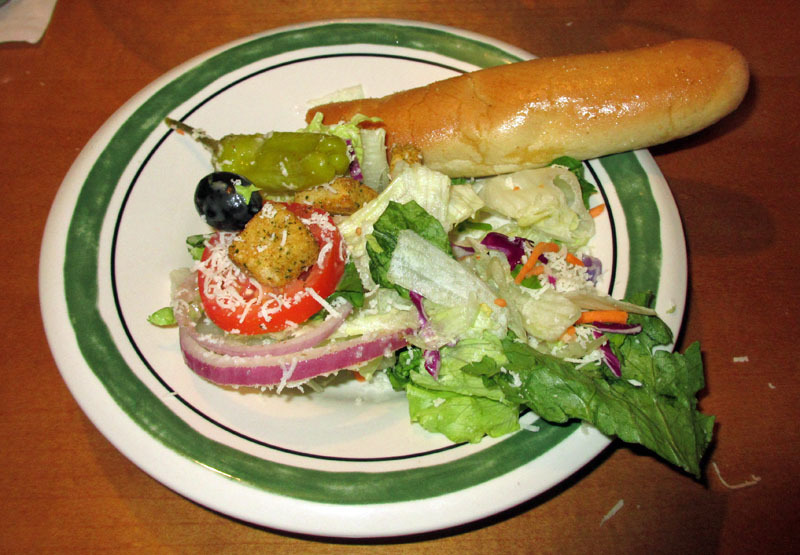 At Olive Garden, the salad is all you can eat, and we ate all we can. It's a nice salad, with mostly romaine but also tomato, olives, red onion, pepperoncini, cheese, and lots of goodness. It's served with their delicious, hot and fresh breadsticks, too. You cannot go wrong with this combination. 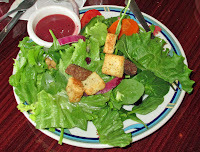 We enjoyed the salad a lot and it was very nice and fresh, all a salad should be. 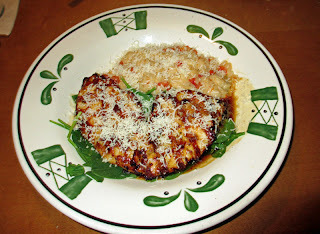 For my main course I had the Grilled Chicken Toscano. This is grilled chicken breasts that are brushed with a sweet red wine demiglace. It was served with fresh spinach and a parmesan risottos with tomatoes. 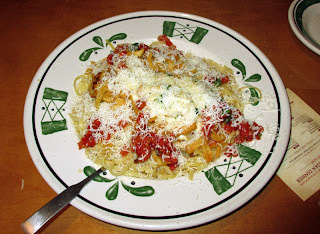 Of course I also had it topped with a generous portion of fresh grated parmesan cheese. It was absolutely delicious. The chicken was nice and moist and tender. The sweet red-wine demiglace was not overpowering but gave a nice rich sweetness to the chicken. The parmesan risotto was done very nicely with still just a bit of tooth-bite, not mushy. I liked this dish a lot. 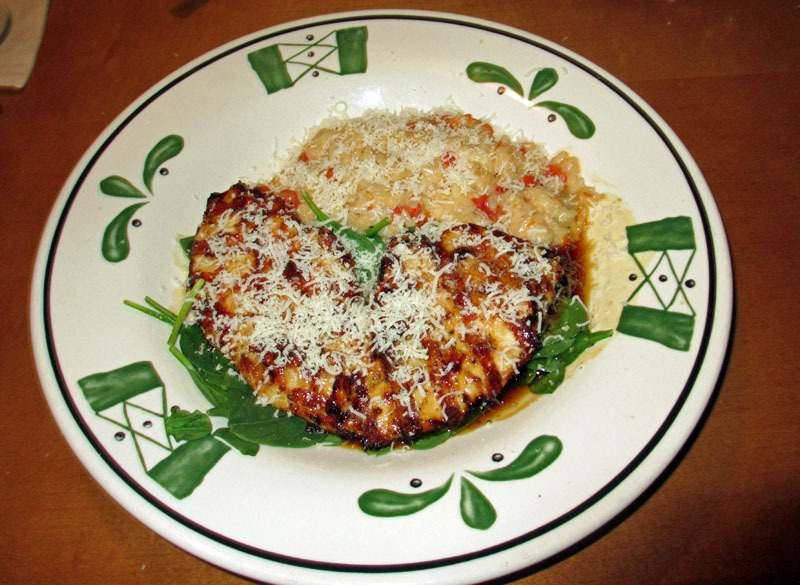 For his entree, Tommy had the Parmesan-Potato Crusted Chicken. It was really very, very good. The chicken was nicely cooked and the crisp parmesan-potato crust was amazingly good. It had a bit of a crunch and the chicken itself was tender and flavorful. It was served on a bed of linguine pasta with a creamy garlic scampi sauce. Now, Tommy is not a huge garlic fan, but he ordered this anyhow. And loved it. The garlic was not at all overpowering but had a nice, sweet, roasted flavor. Again, a great dish. 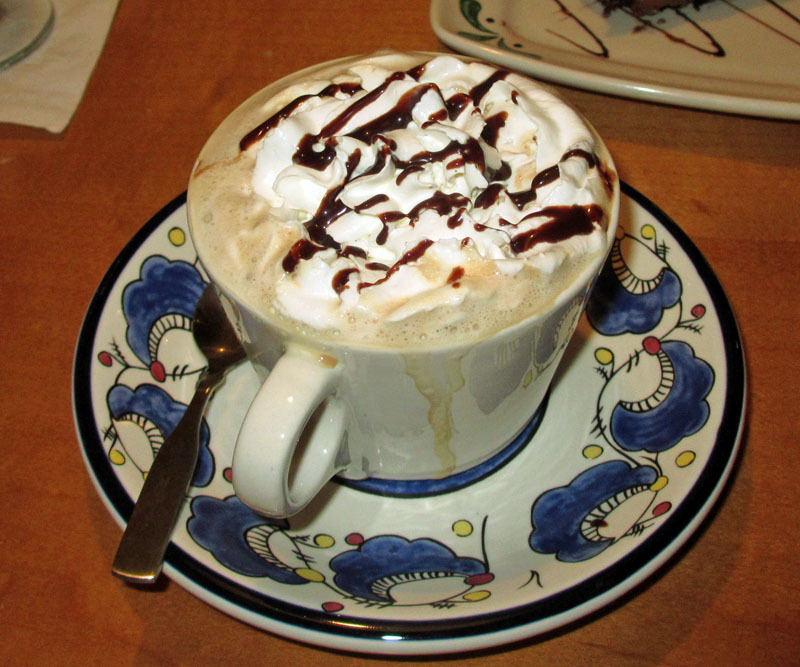 For my "dessert" I chose the Caffe Mocha. 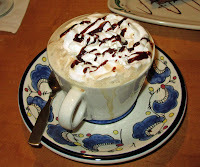 It was all it should be, tasting a lot like hot chocolate made with coffee. It was a nice end to a satisfying meal. Unlike me, Tommy is not averse to sweet, calorie-laden desserts and so he chose the Chocolate Mousse. It was everything a chocolate mousse should be, very chocolaty and nice and rich and creamy. 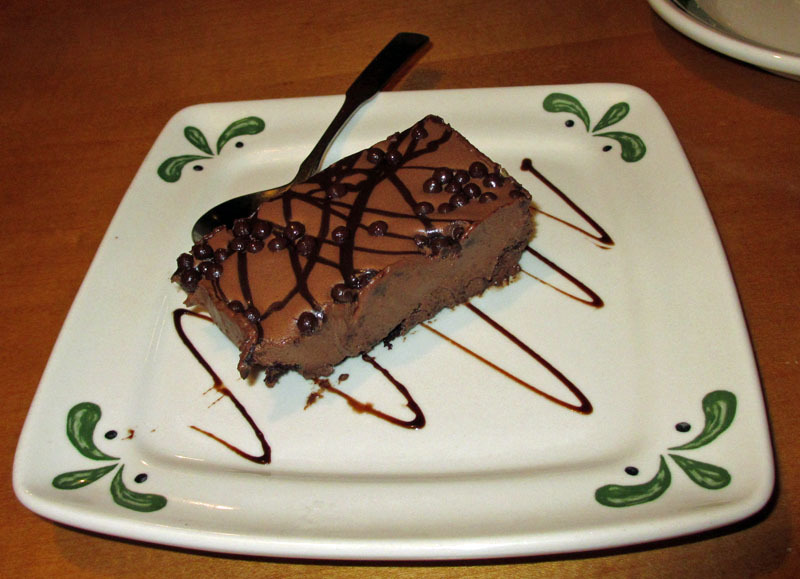 We had a very nice time at the Olive Garden for dinner and certainly would return here. Bryce, our server, did a great job of taking care of us and we left full and with some leftovers to enjoy another day--which we did. Yumm! We had a very enjoyable lunch on a recent weekday at the Palm Tree Grille & Bar in beautiful Mount Dora. We had a generous gift certificate from a friend and so we were able to go all-out and have a wonderful lunch. It was a Monday holiday and downtown Mount Dora was somewhat busy. I'm glad nearly all the shops were open. We were tired after walking around a bit, and so the stop for lunch was very welcome. The restaurant was not very busy and we were quickly seated and waited upon. We each started with a glass of wine and soon decided on some appetizers. For our first appetizer, we chose the Artichoke Gorgonzola. 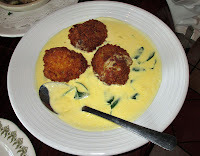 This was whole artichoke hearts stuffed with gorgonzola cheese, breaded and fried and served in an alfredo sauce with spinach. They were good, quite good. I will say that I could have used a bit more gorgonzola. Though it's a strong cheese, it was very light here, so a bit more would have been welcome. Also, the alfredo sauce needed salt and was a bit thin and watery, I think it should have been thicker which would have made it more rich and creamy. And more salt, definitely. But the artichokes themselves were wonderful, I loved them. Next we had the Stuffed Mushroom Caps. Large mushroom caps were stuffed with crabmeat, topped with garlic butter and provolone cheese and then baked. They were very good. The cheese was nice and gooey, the mushroom flavor came through, and the chunks of crab in them rather nice. I liked these a lot. As a prelude to my lunch I had a salad, and it was a delicious salad, chock-full of good things like roasted carrots, garbanzo beans, black olives, mixed romaine and spinach, some red onion, tomato, and home-made croutons. 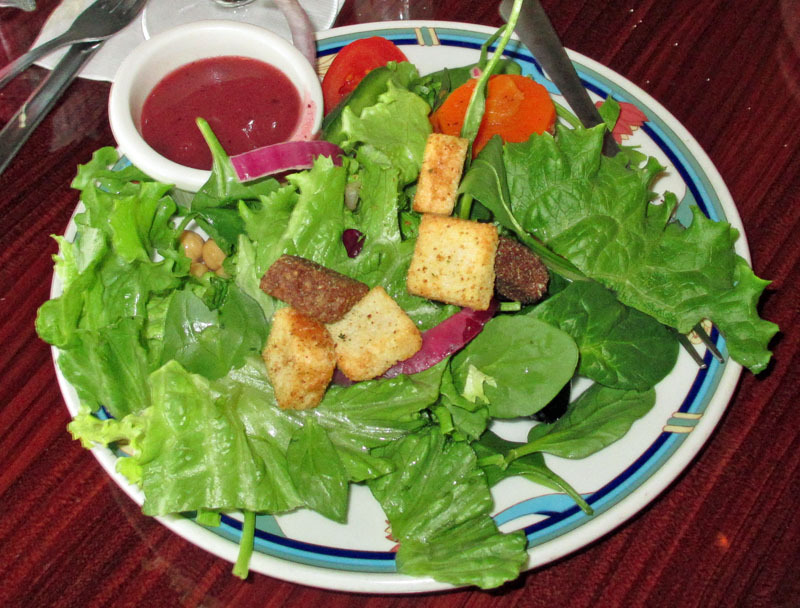 The raspberry vinaigrette served on the side as requested, was delightful, thick and rich yet light in flavor. 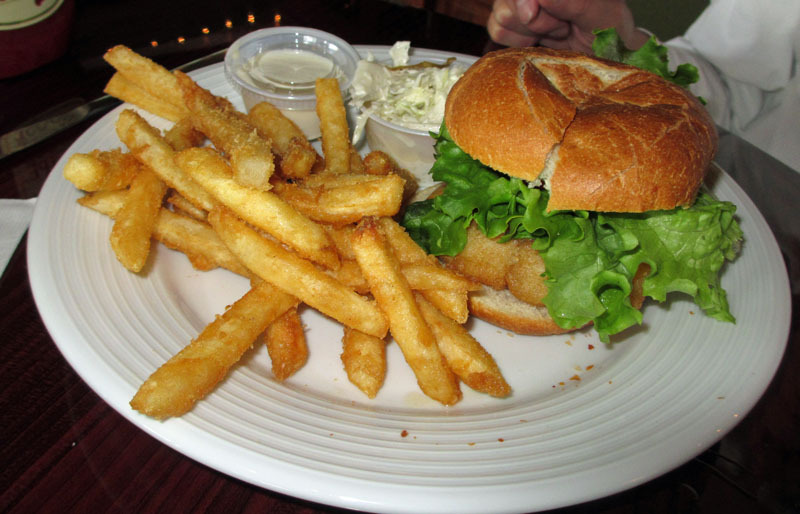 For his main course, Tommy had one of the day's specials, the Fish Sandwich. It was a nice piece of mahi-mahi that was nicely breaded and fried, served over a nice semi-hard roll with the requisite LTO (lettuce, tomato, and onion). The sandwich was very good, hot and tasty. The fish cooked perfectly, moist, tender, and delicious. The accompanying fries were exceptionally good as well, they were perfect and came out piping hot. This was a great lunch. For my main dish I chose Penne Alla Vodka. If a restaurant kitchen can make this dish properly, they will get my vote and I'll be a fan. They get my vote and I'm a fan. It was very good. The pasta was a wonderful al-dente... perfectly cooked. The flavors of the peas, tomato and smoky prosciutto blended well with the pink cream sauce. The romano cheese added the perfect sharpness. I could tell that this dish was cooked properly, with a bit of love and care, not just "stuff" thrown together as in some restaurants. This was cooked to perfection. And, lucky for me, the portion was huge and I had some to take home for another meal--which I enjoyed just as much as the first time. We had a great lunch dining experience here at the Palm Tree Grille & Bar, and I'd certainly recommend them, and certainly return. Nice job!